Iowa has created specific initiatives, coordinated at the state level and offered to all – no need to reinvent the wheel! The $1,000 first prize is sponsored by Iowa Bankers Association. Students submit an essay of 400 words or fewer to the state committee. The essay question, contest deadline & application at http://www.moneysmartweek.org/kids_competition. Essay finalists are announced just prior to Money Smart Week, and the winner reads his/her essay at one or more events during MSW. In the past, finalists have also received a monetary prize. The statewide prize is sponsored by Community Bankers of Iowa, which selects a state winner from all entries provided to them AFTER entries are displayed during Money Smart Week. Contest details are found at http://www.cbiaonline.org. Posters hang in each community (banks, businesses, libraries) during MSW. This is the important part of the contest: the posters hang DURING the week, and the state winner is named shortly AFTER. Local planning teams may also select a local winner (and offer a small prize) prior to sending all posters in for the statewide judging. This statewide program, sponsored by the Iowa Credit Union Foundation, invites grandparents and parents to bring their kids to select credit unions or libraries for a book reading and fun discussion on a money topic. Kids take home the book, one per family. It’s geared to students in 3rd to 5th grade. To request an event, register by the Survey Monkey link here. About 1,000 students played the GeoCache for College Cash game last year, and one student won $1,000 in college tuition, provided by Iowa JumpStart. To play, students found and read 7 posters, each discussing one personal finance topic. Using their mobile devices to scan QR codes, students left answers to 7 quiz questions that every young adult should understand: car loans, college loans, cyber security, credit scores, paychecks, debit cards, and budgeting. To take GeoCache to a campus near you, register by the Survey Monkey link here. This two-part event is designed to promote saving. Part one: A MSW partner hosts an event to create and/or decorate piggy banks, and hosts also do a short discussion on saving (lesson script provided). Hosts can use the cardboard piggy banks, or they can have participants create one from recycled materials. Part two: Piggy banks go on display at a pageant. The decorated piggy banks can be displayed at a venue such as a bank lobby or library – that’s a local pageant. The host may provide a local prize if desired. Each event host can determine how and when the banks are displayed. The Pinterest Pageant – We also encourage event hosts to enter the decorated piggy banks in the Pinterest contest, sponsored by Iowa JumpStart. For this pageant, take a photo of each piggy bank (piggy bank only, no participants or identification in photos) and upload it to the designated Pinterest page. 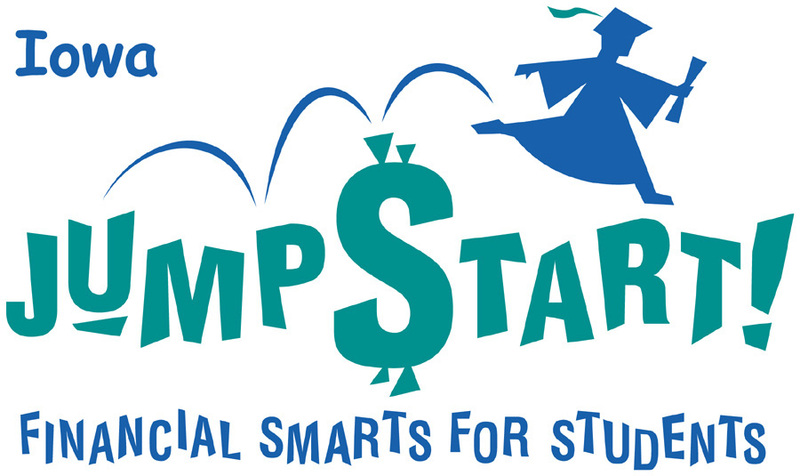 Iowa JumpStart will award a cash prize for: the decorated bank with the most likes, the piggy bank decorated most creatively, and the host site with the most decorated banks pinned. To register as a host site and to request the cardboard piggy banks and savings lesson, use the survey link here. Several communities host an event geared to achieving money management badges for scouting programs. Each community determines the age of scouts (girls and/or boys) to invite. Events are typically held at libraries, schools or community centers. MSW partners staff tables and teach about assigned topics. Scouts move to a new table every 15-20 minutes. Templates for set-up and topics are provided. Scout badges and/or certificates are provided to leaders to award later. To host an event, contact the Iowa JumpStart Coalition or a local MSW community. We love to include these popular events as part of Money Smart Week. This year, partners have arranged to have several events around the state. Hours, location and event specifics are up to the hosting partner. Ben is the mascot for MSW, generally appearing in schools in March and early April. A visit is about 30 minutes, where Ben greets students and encourages them to “save your money” and perhaps takes a few photos and offers his autographs. Ben is not limited to schools. The costume and a script are provided upon request. Ben must be accompanied by a local volunteer driver.